"There's a lot of activity happening in our night skies," says Shrinivas (“Shri”) Kulkarni, the principal investigator of ZTF and the George Ellery Hale Professor of Astronomy and Planetary Science at Caltech. "In fact, every second, somewhere in the universe, there's a supernova that's exploding. Of course, we can't see them all, but with ZTF we will see up to tens of thousands of explosive transients every year over the three-year lifetime of the project." From 2009 to 2017, ZTF’s predecessor, the Palomar Transient Factory, caught the blinking, flaring, and other real-time changes of transient objects in the sky. 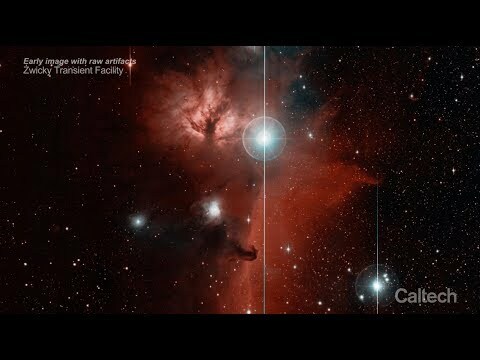 The project took advantage of the fact that Palomar has three telescopes—the 48-inch Samuel Oschin Telescope, the 60-inch telescope and the 200-inch Hale Telescope—all under the management of Caltech. During the Palomar Transient Factory's surveys, the automated Samuel Oschin Telescope acted as the discovery engine, with the automated 60-inch following up on any targets found and gleaning information about their identities. From there, astronomers would use the larger 200-inch Hale Telescope—or the W. M. Keck Observatory, which is co-managed by Caltech—to study in detail the various cosmic characters that enliven our night skies. Astronomers are excited for the unexpected findings that will come from ZTF. One of the Palomar Transient Factory's biggest discoveries came in 2011 when it caught a supernova, named SN 2011fe, just hours after it had exploded. ZTF will further expand our knowledge of young supernovas along with a host of other cosmic objects, including planets around young stars, exotic binary star systems, and near-Earth asteroids.